Hyundai has finally decided to treat our eyes with their sixth-generation Elantra at an introductory price of Rs 12.99 lakh (ex-showroom Delhi). The Hyundai Elantra is launched in a segment where it would compete with super premium sedans such as the Volkswagen Jetta, the Toyota Corolla, the Chevrolet Cruze, and the Skoda Octavia. The petrol version of Elantra would cost you around Rs. 12.99 lakh, while the top-end diesel automatic would cost Rs 19.99 lakh (all ex-showroom, Delhi). 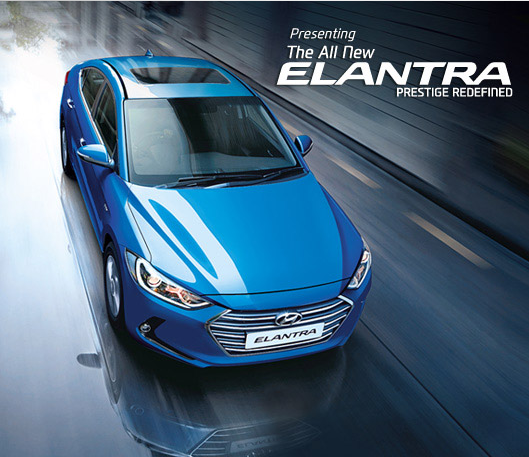 Elantra is offered with two engine options – a 2 litre – VTVT petrol and 1.6 litre CRDi diesel. The 1,999 cc petrol engine churns out 152 PS at 6,200rpm and 178Nm of max torque at 4,700rpm. The 1,5822cc diesel engine produces 128 PS at 4,000rpm and 260Nm of peak torque in between 1,900-2,750rpm. Transmission options consist of six-speed manual and automatic, which is available in both the engines. The most prominent change in the latest Hyundai Elantra is the brand new 2.0 – litre naturally aspirated Atkinson cycle petrol engine. The carmaker has given the new Elantra minor updates, while maintaining its body structure and ‘Fluidic’ design philosophy. Starting with the frontage, it is given a slightly refined bumper, and the fog light consoles are redesigned. Furthermore, adding to its style quotient is its slightly bigger fog lights. The headlight cluster has been kept the same, however it is now equipped with projector headlamps coupled with LED guide giving a commanding stance to the frontage. No other changes are made to this facet. The upper radiator of the grille is extremely small and is handsomely fitted with a chrome plated strip, which is further embedded with the logo of the company. The coupe inspired roof line of the car extends into the chiseled boot which is fitted with beautiful tail lamps inspired from the Elite i20. Hyundai has made quite some changes to its interiors by giving it an all-black scheme. The car is also fitted with aluminum pedals and premium door scuff plates that comes with ‘Elantra’ lettering, which gives the cabin a regal look. The cockpit section of the car is fitted with an improved floor console that affords you with a cup holder and center armrest. The dashboard of Elantra is also modernized with a world-class infotainment system featuring a 4.3-inch color display. Push-button start, wipers with rain sensors, auto dimming internal mirrors, and many other gadgets are predicted to be a part of the standard equipment. Hyundai is giving its customer both engines with an option to select from six speed manual and automatic transmission. The diesel engine has the ability to accelerate from 0 to 100 kmph mark in roughly 15 seconds. The diesel variant can reach a top speed of about 190 Kmph. On the other hand, the petrol variant of Elantra reaches a maximum speed of 195 Kmph, breaking the 0-100 barrier in about 12 seconds. As there are no changes in the engine of the new Elantra, the mileage of the car remains similar to its earlier version. The 1.6-litre diesel motor is assimilated with a common rail direct injection fuel supply system that improves the fuel efficiency of the car. This engine helps the vehicle in delivering a minimum mileage of 18 Kmpl, which can go up to 22.7 kmpl, which is really commendable. However, the Elantra automatic version gives you a maximum mileage of 19.5 Kmpl. The petrol version of the car is integrated with a critically celebrated multi point fuel injection supply system that enables the motor to give away a peak mileage of 16.3 Kmpl, while the automatic version only manages to produce about 14.5 Kmpl on the expressways. 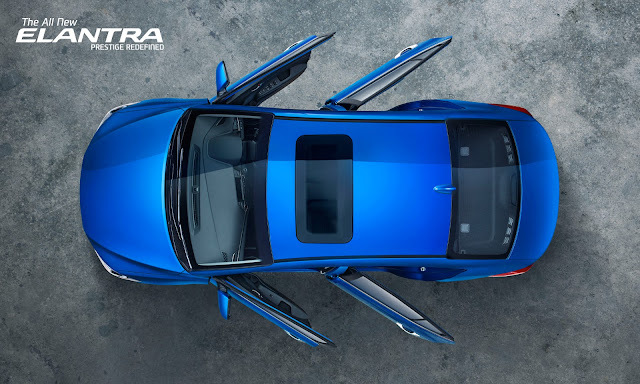 Hyundai Elantra comes with exceptional braking system that delivers top notch performance irrespective of the weather condition. All 4 wheels of the car have been fitted with sturdy set of disc brakes and they come with superior brake calipers. The brakes are further supported with anti-lock braking system and electronic brake force distribution, which improves the entire braking experience. The front axle of the car is fitted with McPherson strut coupled with coil spring, whereas the rear one is paired to coupled torsion beam type suspension. This suspension system helps in improving the overall stability of the vehicle, especially on roads filled with bumps and potholes. Hyundai has blessed its SX variants with vehicle stability management together with an electronic stability program that improves its ability when it comes to tackling curves. It is also gifted with a highly responsive power steering system that affords you with precise response further improving the handling of the car. Check here for Hyundai Elantra Price, specifications and more details.